The Belmont community of Reflection Pointe is an upscale, gated neighborhood on the tip of the peninsula formed by the Catawba and South Fork rivers. This beautiful waterfront property sold in 2015. The waterfront community is just 10 minutes south of historic downtown Belmont via Southpoint Road and has 362 home sites for your perfect custom home. You can bring in your own builder or choose from the community’s list of approved builders. There are many homes already built but also many lots available. Reflection Pointe’s location is fantastic with only a 30 minute commute into Center City and about 25 minutes to Charlotte Douglas airport. Both Wilkinson Boulevard and I-85 can bring you to I-485 loop. Community amenities include a freeform, lagoon-style swimming pool, clubhouse, lighted tennis courts, paved walking trails, recreation field, playground and a marina with deeded boat slips and a sandy beach. Some of the builders that have built custom homes in the neighborhood are McSpadden Custom Homes, Rouse Builders and Yeary Homes. The view from one of the waterfront homes in Reflection Pointe. Interior homes start in the $400,000s, and waterfront homes are $900,000 and up. Lots are priced from $150,000 to $450,000 for dockable waterfront and $50,000 to $100,000 for interior lots. Three resale homes sold during the last 12 months in Reflection Pointe for an average sales price of $845,000 and $162 per square foot. Two of the homes sold were waterfront properties; one sold for $1.3 million and the other $870,000. The interior home sold for $365,000. 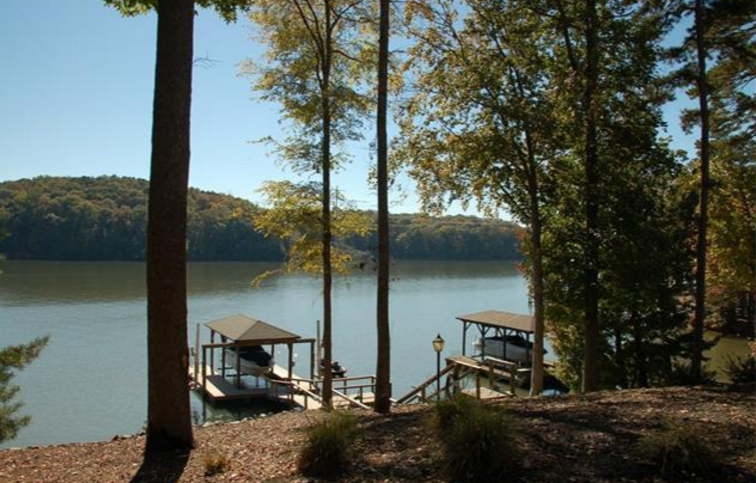 There are currently 8 homes listed for sale in Reflection Pointe. Four of the properties are waterfront – 3 resale homes and 1 pre-construction home. The waterfront home list prices range from $839,000 to $1 million. Two are under contract as of April 7. One beautiful water view resale home is listed for $850,000. The remaining 3 homes for sale are interior resale homes and range in list price from $499,900 to $630,000. For information regarding building lots, see the Reflection Pointe HOA web site. Homes in the neighborhood are zoned for Gaston County’s Belmont Central Elementary, Belmont Middle School and South Point (N.C.) High School.